Everyday thousands of Indigenous Peoples all of the World are challenged to protect all that is sacred, the land, air, water...all that is Mother Earth and every living being. This also requires Indigenous Peoples to unite with each other Internationally and with allies. This means we are all connected...Interpedendant and Interconnected on Mother Earth. There is no time to wait, we need each other more than ever to TAKE A STAND for ourselves, all living, and protect ourselves from extinction. Scientists estimate with our oceans dying due to oil industry, forestry etc...we need to rethink what "development" means...embrace "sustainability"...and accept we all need each other to exist and co-exist. Letter from the courageous and inspirational Indigenous People of Brazil's Amazon Rainforest, who occupied Belo Monte for 9 days, ending today, when troops moved in to remove them. "We are the people who live in the rivers where you want to build dams. We are the Munduruku, Juruna, Kayapo, Xipaya, Kuruaya, Asurini, Parakanã, Arara,fishermen and peopleswho live in riverine communities. 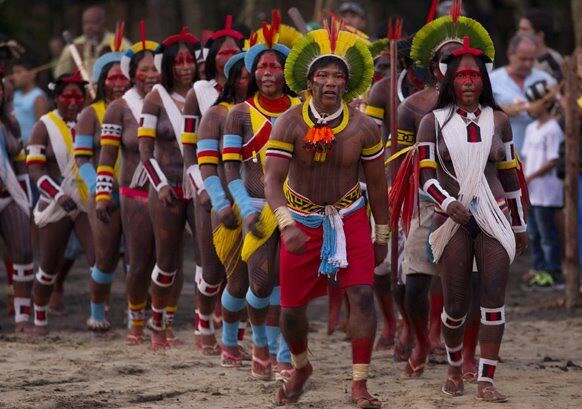 We are Amazonian peoples and we want the forest to stand. We are Brazilians. The river and the forest are our supermarket. Our ancestors are older than Jesus Christ. You are pointing guns at our heads. You raid our territories with war trucks and soldiers. You have made the fish disappear and you are robbing the bones of our ancestors who are buried on our lands. You do this because you are afraid to listen to us. You are afraid to hear that we don’t want dams on our rivers, and afraid to understand why we don’t want them. You invent stories that we are violent and that we want war. Who are the ones killing our relatives? How many white people have died in comparison to how many Indigenous people have died? You are the ones killing us, quickly or slowly. We’re dying and with each dam that is built, more of us will die. When we try to talk with you, you bring tanks, helicopters, soldiers,machineguns and stun weapons. What we want is simple: You need to uphold the law and promote enacting legislation on free, prior and informed consent for indigenous peoples. Until that happens you need to stop all construction, studies, and police operations in the Xingu, Tapajos and Teles Pires rivers. And then you need to consult us. We want dialogue, but you are not letting us speak. This is why we are occupying your dam-building site. You need to stop everything and simply listen to us."